Dismal action/adventure fantasy that consists of nothing more than a series of badly directed fight sequences and fails to engage on every conceivable level, thanks to poor direction, lacklustre performances and a badly written, frequently idiotic script. Directed by Norwegian filmmaker Tommy Wirkola, Hansel & Gretel: Witch Hunters begins with the familiar fairy tale version of the story, in which young siblings Hansel and Gretel (Cedric Eich and Alea Sophia Boudodimos) kill a witch by shoving her into an oven after a traumatic encounter in a gingerbread house. 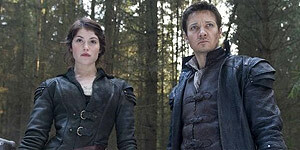 Fifteen years later and grown-up Hansel (Jeremy Renner) and Gretel (Gemma Arterton) have turned professional Witch Hunters, travelling the land and killing witches, armed with an array of ridiculously souped-up weaponry. Summoned by Mayor Engleman (Rainer Bock), Hansel and Gretel arrive in a small town just in time to stop Sheriff Berringer (Peter Stormare) from killing Mina (Pihla Viitala), a young woman accused of being a witch. Having angered Berringer, Hansel and Gretel find they have their hands full, fending off both the Sheriff's minions and an imminent attack by evil witch Muriel (Famke Janssen). Fortunately they receive help in the unlikely forms of a fanboy teenager (Gabriel Mann) and a giant troll (Derek Mears, but voiced by Robin Atkin Downes) called Edward. Gemma Arterton and Jeremy Renner do their best, but they're saddled with an extremely weak script that barely gives them enough dialogue to get them from action sequence to action sequence, while the sibling relationship mitigates against any chemistry the two stars might have had together. Consequently, none of the supporting characters are fleshed out properly and nobody looks like they're enjoying themselves, not even Famke Janssen, whose half-hearted Muriel comes across as a wasted opportunity rather than the camp-turned-up-to-eleven performance it should have been. Wirkola is best known for Nazi zombie movie Dead Snow (tagline: ‘Ein! Zwei! Die!’), which made up in wit and invention what it lacked in budget. Unfortunately, Hansel & Gretel: Witch Hunters fails to deliver on Dead Snow's promise; all the thought has clearly gone into the frankly irritating anachronistic weaponry (the recent Three Musketeers film had the same problem) rather than providing a gripping story or emotionally involving characters. On top of that, the fight scenes lack imagination (the only good bit involves the troll and Peter Stormare's character), with the finale devolving into a CGI-heavy fracas involving characters we've only just met. Similarly, the film has the occasional idiotic moment (such as Gretel giving her arrows an electrical charge and using them as defibrillators) that is meant to be amusing and clever but ends up being both distracting and annoying instead. Despite the best efforts of Arterton and Renner, Hansel & Gretel: Witch Hunters is a grimly disappointing fantasy adventure let down by a weak script, unengaging action sequences and a general lack of imagination.